I wouldn't go so far as to say it's one of gaming's greatest atrocities, but I'd definitely say it's a bit of a shame that the Taisen Puzzle Dama series--think Puyo Puyo with bells instead of blobs and subtly different rules--has yet to make its way to the States. 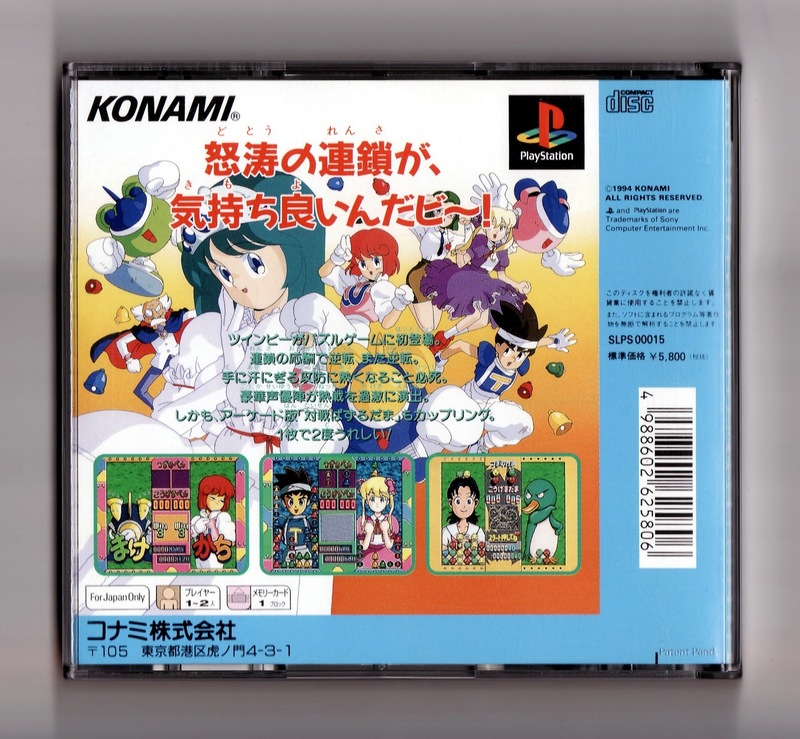 Three Taisen Puzzle Dama games were released for the PlayStation in Japan--including one that features characters from Konami's Tokimeki Memorial series and one that's called Susume! 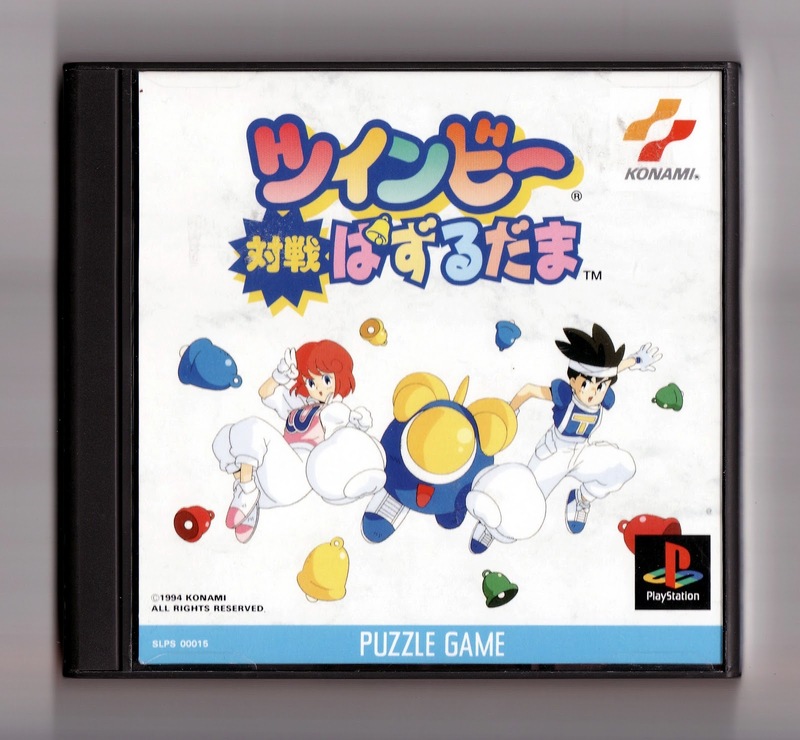 Taisen Puzzle Dama (sorry, I have no idea what "susume" means)--in the mid-1990s, with this TwinBee-themed iteration being the best of the bunch, in my somewhat uneducated opinion. (Although I own all three of the aforementioned games, I've spent quite a bit more time with TwinBee Taisen Puzzle Dama than its successors.) That said, I wouldn't suggest running out and buying a copy unless you're a huge puzzler and/or TwinBee fan, as it's been bested by a number of its peers (namely Puyo Puyo and Super Puzzle Fighter II Turbo). Have a great day and keep playing! Hey there, Marcus! Thanks for the comment! I hope this won't be your last one (comment, that is). As for being inspired by my 'Great Gaymathon' posts -- I think it's great! It's not like my idea was original, anyway -- I was inspired by other sites, too -- like gamengai.com and videogameden.com. So, thanks again for the comment and for letting me know about your blog. Best of luck to you with your reviews, and don't be a stranger here, OK? BTW, I should add one note here: This version of the game also features, as a not-so-hidden bonus, the original Taisen Puzzle Dama game, which is pretty cool if you ask me. So, you get two games for one when you buy this one: The arcade original and the TwinBee-themed version. Oh, and even though the game is in Japanese, the language shouldn't pose much of a challenge to folks who don't understand Japanese. I've never had any problems enjoying it (or the other Taisen Puzzle Dama games in my collection), at the very least. Hm. I never loved Puyo Puyo, but I played it as Dr. Robotnik's Mean Bean Machine. I believe they're fairly similar, aren't they? Oh, and Marcus, I bookmarked your blog after visiting briefly. I'm definitely going to be checking in on it! Dr. Robotnik's Mean Bean Machine *is* Puyo Puyo, Justin. Sega just altered the graphics so it had a Sonic connection before they released the game in the US. So, if you didn't like that game, you definitely wouldn't like this one. Yeah...it was just kind of okay. The difficulty curve was really brutal, too. Yeah, these games always seem to have a steep difficulty curve -- which usually keeps me from playing them for too long. You'd probably like the original Taisen Puzzle Dama (which is included on this disc) and Susume! Tasien Puzzle Dama, Simon -- they're completely wacky.